If you make it this far you will be on your own. There is a woodcock here somewhere. Good luck! This BirdingAsia paper has super detailed and mostly reliable info on Obi: Mittermeier, J. C., Cottee-Jones, E. W., Kennedy, J. D., Reeve, A. H., Rosyadi, I. 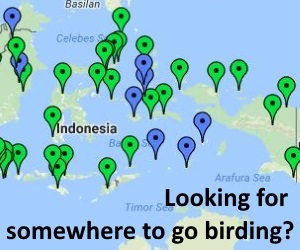 & Thibault, M. 2015 Obi, North Molucca, Indonesia: a visitor’s guide to finding the endemics. 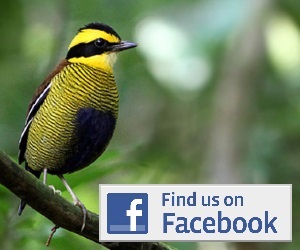 BirdingAsia 23, 66–76. The following blends this information with my own experience spending less than a week in the Jikotamo area without trying to visit places on the south shore or higher altitudes. Access from Ternate: The island of Obi is actually straightforward to reach if you have the time. The ferry journey from Ternate is however 24h long despite the actual distance being only about 200km I believe. At the time of my visit, ferries left every day except Sunday, from Ternate’s Bastiong-satu harbour (about 500m from where the ferries from Sofifi land and a 10 minute ojek ride from where the speedboats land). Departure was scheduled at 20:00, happened around 22:30. After stops on Bacan island, the ferry arrived in Jikotamo harbor on the northern coast of Obi at around 15:00. If travelling in a large party, the economy class could be an option (request one or two more beds than necessary and put your luggage there), but if traveling alone or in a small party, I strongly advise to book a cabin (kamar). Those cabins sometimes get fully booked so plan ahead. Accommodation: I stayed the whole time at the Sabar family’s in Jikotamo harbor, as recommended by Mittermeier et al.. I pitched my tent in their front yard and walked/ojeked my way to the birding sites everyday. However, in retrospect it would have been much, much wiser to camp at the birding sites and use the Sabar’s front yard only one or two nights. The major advantage is that the Sabars cooked for me and were very helpful, driving me to the birding sites etc. The older daughter, now living in Ternate, is an English speaker, which is the reason why the family has become the point of contact for foreigners landing on Obi. The rest of the family does not speak English however, just a few words here and there, but combined with my protozoan-level Indonesian, and lots of smiling, the situation proved efficient enough. Birds: There are two main birding sites near Jikotamo which are very well described in the BirdingAsia article. After my visit the Sabars and especially Unki should be able to take you there without even having to ask. The site along the Sembiki logging road produced an Obi woodcock on the ground but none seen displaying. Other good birds included Moluccan Cuckoo, Moluccan red-bellied Pitta, Cinnamon-breasted Whistler (Drab Whistler), Island Monarch, Obi Spectacled-monarch, Moluccan Flycatcher (Slaty FC). Walking from Jikotamo was tiring but quite productive, in particular yielding a super close sighting of Rufous-necked Sparrowhawk (rarely recorded by birders in Halmahera) and an immature-plumaged Parrotfinch (there are no parrotfinch known from the island). Walking further up the logging road into the hills was quite birdy and produced a pair of Pale Cicadabird (also rarely recorded by birders in Halmahera) but no Carunculated FD, which possibly does not occur there anymore due to overtrapping. The Cabang Kuning / Sumbali river area was clearly in a better conservation state but here also I did not manage any sighting of displaying woodcock, until my last evening (a distant one seen from the Cabang Kuning rice fields). Note: when asking your way towards Cabang Kuning it will be useful to know the word “sawa” which means the specific rice growing system in use over there. People looked at me with blank eyes when I asked where the “paddi” were. For the Sumbali river confluence (where the Mittermeier et al team had apparently super close sightings of displaying woodcocks), just follow the trail along the river bank towards the south. I found a single Carunculated FD along this trail, luckily one of my best view ever of any fruit-dove. Other good birds along that same trail included Moluccan Cuckoo, Spectacled Imperial-Pigeon, Violet-necked Lory, Red-flanked Lorikeet, Red-cheeked Parrot. In the ricefields of Cabang Kuning I saw Spotted Whistling-duck, Rufous Night-heron and White-browed Crake which was cool, but I could not relocate any of the rare rails that the Mittermeier team found. The conditions were quite possibly much drier during my visit than theirs. Obi Golden-bulbul, Blue-and-white KF and Obi Paradise-crow were common throughout. There is a trail to higher elevation but it was overgrown. You’d have to contact the local kepala desa to organize a daily excursion with machettes. Note that the Obi ferry crosses the Bacan straight between Obi and Bacan. This area proved interesting for seabirds and cetaceans: Matsudeira’s Storm-petrel (one individual with obvious white area at the basis of primaries and very brown plumage), Brown Booby, Brown Noddy, Sooty Tern, Great Crested-tern, tursiops dolphins, spinner dolphins, and a dyad of Mesoplodons that, based on known distributions, were probably Gingko-toothed Beaked-whales.